The BlackBerry Torch 9800 is the first BlackBerry smartphone to combine a touchscreen and a physical QWERTY keyboard. The handset also runs the new BlackBerry 6 OS and features a refreshed home screen and various software improvements, including a greatly improved Web browser. Ultimately, the BlackBerry Torch 9800 is much the same as most BlackBerry handsets: it possesses a great keyboard and best-in-class e-mail capabilities, but offers nothing new or innovative. This is yet another smartphone that should please most existing BlackBerry users, but it offers no real incentive for others to switch to the platform. The BlackBerry Torch 9800 has a new slider form factor, but it shares a striking resemblance to almost every other BlackBerry released in the last few years. It looks like a BlackBerry Bold 9700 with a larger screen and a slider. 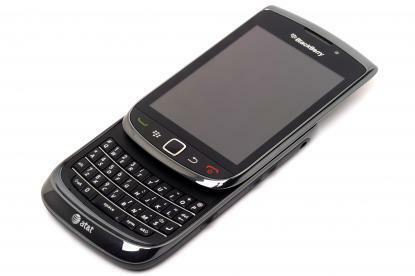 It features a very similar QWERTY keyboard, the same trackpad and menu keys and its design doesn't stray to far from the traditional candybar BlackBerry. The external volume buttons and camera key look as if they're bulging from the plastic edging on each side and are easy to press, but the lock and mute buttons on top are a bit too easy to accidentally press. Build quality is reasonable, though the slider does wiggle slightly and the phone can often be difficult to quickly slide open with one hand. The BlackBerry Torch still looks like a corporate phone; we think RIM really needs to revamp the physical design completely. The BlackBerry Torch's capacitive touchscreen display is responsive, and the scrapping of the clunky SurePress technology used on the BlackBerry Storm is a positive. However, the screen is clearly inferior to the displays on the iPhone 4, HTC Desire and the Samsung Galaxy S, thanks to its relatively low resolution. Text isn't as crisp when browsing the Web and images possess far less detail. Like almost all BlackBerrys the Torch 9800 benefits from an exceptionally good keyboard; it's almost identical to the Bold 9700's, but it is slightly narrower and sits a little deeper into the chassis. It doesn't quite match the outstanding keyboard on the original Bold, but current BlackBerry users will be right at home. The slider design makes the BlackBerry Torch quite large when opened, and the design is a little top-heavy. The BlackBerry Torch runs the latest version of BlackBerry OS and it offers plenty of improvements over previous editions. The home screen looks attractive, and uses a very handy notifications bar that drops down when you tap the display. This will show all your notifications including e-mail, calendar, text messages, and Facebook and Twitter updates. You can also select a profile and start a universal search on the home screen, while tapping on the time brings down a quick settings bar; you can turn on Bluetooth and Wi-Fi, set an alarm, and adjust a wealth of set up options. BlackBerry OS 6 also integrates "Social Feeds," aggregating feeds from Facebook and Twitter. The OS has an excellent universal search tool, and it offers a much better Web browsing experience than previous versions. You can double tap on a block of text to centre the text, use pinch gestures to zoom in on Web pages and the entire browsing experience feels much improved compared to previous BlackBerrys. BlackBerry OS 6 also uses what RIM calls a "drawer" to store applications. Where Apple uses a simple grid layout of icons on the home screen, and Google's Android opts for shortcuts combined with widgets, the BlackBerry Torch uses a drawer that can be opened up by tapping the bottom of the screen. Swiping across the screen will access different draws; all of your applications (main menu), your favourite apps (user definable), media, your downloads from BlackBerry App World, and frequently used applications. Unfortunately, these drawers can't be edited or modified, apart from choosing what to place in each one. In a nutshell, many aspects of BlackBerry OS 6 have been improved but it lacks consistency. This OS has been built for both touchscreen and non-touchscreen BlackBerry smartphones and it shows in some basic aspects — for example, you can control most actions via the touchscreen, but can't go back to a previous screen without using the physical keys, and holding down on the screen to bring up context-sensitive options doesn't work in all menus. We also felt as if the Torch 9800's hardware struggled to keep up with its software — it often seemed sluggish during basic tasks, such as switching between running apps or opening the browser. Any BlackBerry is primarily an e-mail device and the Torch 9800 supports e-mail through the BlackBerry Internet Service (BIS) or the BlackBerry Enterprise Service (BES). Microsoft Word, Excel and PowerPoint documents can be viewed and edited thanks to the on-board Word To Go and Sheet To Go applications. In addition to 3G connectivity, the BlackBerry Torch 9800 has Wi-Fi, GPS and Bluetooth capabilities. The BlackBerry Torch provides access to BlackBerry App World, RIM's third-party app store. It doesn't boast the same number of apps as Apple's App Store or Google's Android Market, but paid apps can finally be purchased in Australia (using PayPal) and most of the popular apps (such as Facebook, Twitter, eBay and Windows Live Messenger) are available. The BlackBerry Torch 9800 is a capable media player and the interface has been given a fresh overhaul. We particularly liked the album cover view, which is very similar to Cover Flow on the iPhone. The display handles video content well, but you can't help feeling a little disappointed when you compare it to the bigger, brighter displays of competing smartphones. The phone has a 3.5mm headphone jack and a microSD card slot, while the 5-megapixel camera doubles as a video recorder. Our photos often appeared blurry and the phone can't record HD video (a feature that’s quickly becoming the norm on high-end smartphones). One real positive is the BlackBerry Torch's battery life — it often lasted almost two days during testing, placing it far ahead of most of its rivals and making it a handy device for road warriors. The BlackBerry Torch isn't yet available in Australia, but can be purchased outright and unlocked from online store MobiCity. Features: Camera resolution (megapixels): 5. Geotagging: Yes.